Even before the rise of craft beer, there have been those who have sought out the world’s rarest beers. In much the same way as a collector of fine wine seeks out rare vintages from the best producers, beer collectors seek beers made by brewers – both foreign and domestic – that may have seen very limited distribution and yet are of the highest quality. Rare beers fall into three categories: whales, white whales and ghost whales. Whales are big beers that saw distribution in just a small geographic area or had a wider distribution, but it had a relatively small amount released to distribution. Beers like 3 Floyds Brewing Company’s Dark Lord, a massive Russian Imperial Stout brewed with coffee, Mexican vanilla and Indian sugar, have gained cult status and are highly-sought among beer traders. In the case of Dark Lord, the beer is only released one day per year at a ticketed event thrown by the brewery. If you don’t go to the event, the only way to get a bottle is from someone who did or someone who traded with someone who did. White Whales are those beer that are even more rare than whales. These beers often come from small producers who only sell bottles from their brewery or have extremely limited distribution. It is not unusual for a U.S. city to only get one or two six-bottle cases per year of this type of beer. Cantillon, a producer of lambic beers located in a somewhat run-down neighborhood of Brussels, Belgium produces a number of beers that cause beer geeks to squeal like a child getting his or her first puppy. Often, Cantillon’s beers can only be purchased at the brewery in Brussels. Add to that the process it takes to produce a lambic – lambics are often blended from beers of varying age and fruit additions – and you have a recipe for a rare beer. In the case of Cantillon’s Lou Pepe Gueuze, two-year-old lambic aged in barrels that previously held wine is used to coax a mellow flavor. Bottles of pre-2002 Lou Pepe are particularly rare and push the limit of white whale and could fall in to the realm of ghost whale. The rarest beers, those that saw only a few bottles leave the brewery are called ghost whales. These are beers that could easily sell for thousands of dollars among collectors. Beers like Brew Dogs’ The End of History falls squarely into this category. Only 12 bottles were produced of this 55% ABV brew and those were famously – and to some horrifically – presented in packaging that consisted of a taxidermed roadkill squirrel or stoat (also known as the short-tailed weasel). Those original bottles, brewed in 2010, sold for $765 each and came with a signed certificate of authenticity. But, the brewery recently announced a re-re-release of the controversial beer that will sell for $20,000 and includes an ownership stake in the Brew Dog. For the run-of-the-mill beer hunter, snagging a whale brew like Cigar City Brewing Company’s Hunahpu’s Imperial Stout – released only one day per year at the brewery’s annual release day/beer festival – is a reason to celebrate. To others, only something like the white whale Lost Abbey’s Duck Duck Gooze – an American-brewed, Belgian-style gueuse – that is extremely difficult to get hold of will do. Regardless of your preference for whales, if you get your hands on one, the decisions have just begun. Should you drink it, cellar it, trade it? My advice, do what you want, it’s yours. But, I am inclined to drink it! If it weren’t for monks, many of the classic beer styles we now enjoy may not have been developed. In particular, Belgian monks from the Order of Cistercians of the Strict Observance, a Roman Catholic contemplative order that believes monasteries should be self-sustaining. Because of this, monks took up many trades, brewing highly-coveted beer was among them. A favorite style produced by monks – the tripel – was developed relatively recently at the Brouwerij der Trappisten van Westmalle or Westmalle Brewery in 1934. As a style, tripels are golden in color with aromas and flavors of apple, pear, citrus, or banana-like fruitiness, clove-like or peppery spice. Other characteristics of the style are its high alcohol (7-percent to 10-percent by volume) and its dry finish. As early as the 6th century, monks were brewing beer. The story of the brewery at Westmalle Abbey begins in 1836 when monks began brewing beer at the Abbey. At that time, the beer was not intended to produce a profit, instead it was to be used only for the refreshment of the monks and their guests. Later, in 1856, the Abbey began selling a small portion of the beer to villagers at the gates to the monastery. As demand grew the Abbey did, too. Expansions were undertaken in both 1865 and 1897. In those early years, the brewery produced mostly dark beers. Westmalle was best known for its dubbel, a strong dark ale that developed flavor by boiling the wort for eight to ten hours. The long boil was thought to develop the deep color and complex flavors. Demand continues to rise and, in 1921, the Abbey decided to sell their beer to outside resellers. This necessitated another expansion that included that construction of a dedicated yeast room and a workshop. When completed in 1934, the new additions are celebrated by the introduction of a new style of beer; the tripel. Because the palates of Belgians at that time were more attuned to darker, richer ales, the release of the golden-hued tripel was considered a radical move by a group that was known to be overwhelmingly traditional. But, as drinkers began tasting the fruity, high-alcohol brew, demand began to grow. For the next 20 years, the monks tinkered with the recipe until 1954 when Brother Thomas Sas dialed the formula in and created the tripel we know today. So, important was it to the monks that the character of the tripel remain intact they instructed Jan Adriaensens, who has overseen brewing at Westmalle since 1982 he was to make no alterations. So, when the brewery decided to switch from square fermenters to the more modern conical style, he spent eight years experimenting on a smaller pilot system to ensure the beer would not be effected. Though the tripel produced by Westmalle is the original and standard bearer for the style, other breweries have produced their own versions. Here are a few to look for at your local market. Creamy and fruity with plenty of alcohol punch, this beer the Colorado and now North Carolina brewery reveals citrus, dark fruit and other spicy flavors. Easy drinking and refreshing despite its 9.5% ABV, this one will sneak up on you if you aren’t careful. When this tasty Belgian-style tripel is on tap, it treats drinkers to a solid, boozy experience redolent with cracker, spice and pepper. Beer is a many splendor thing, whether it is in the form of an IPA, stout, kolsch or pale ale, there is an ever-changing kaleidoscope of flavors to choose from. And craft beer lovers like it that way. All one has to do is pay attention to the weekly offerings at many of the local breweries to see that mid-week most offer a variation to one of their current brews. Be it an herb-infused saison or an IPA aged on fruit, variety is the name of the game. One of the hottest emerging trends in the world of craft beer is fruit-infused brew. Sure, the Belgians have had fruit in their beer for more than a century. Breweries such as Brasserie Cantillon in Brussels created Framboise (raspberry) and Kriek (cherry) lambics more than 100 years ago. Lambics are a style of ale that is not inoculated with yeast; instead it is allowed to spontaneously ferment from yeast present in the air that gets to the beer via open air cooling vessels often located on the roof or the top floor of the brewery that is open to the outside. As a modern phenomenon, fruit beers come in several iterations; fruit additions to typical styles like IPAs and stouts, styles that have traditionally included fruit or fruit syrup additions like Berliner Weisse and hybrid styles that are created specifically to highlight fruit flavors like apple ales. A trip to your local beer monger will reveal an ever-increasing shift towards fruit-flavors in familiar styles. The highly-rated IPA Sculpin from Ballast Point Brewing Company of San Diego, Calif. now comes in a wide array of fruit flavors like grapefruit, pineapple and even habanero (yes, peppers are technically fruits). Another style that has had the fruit-infusion treatment is farmhouse ale. This style, akin to saison, has been refreshingly imbued with peach by Terrapin Beer Company of Athens, Ga. in their Maggie’s Peach Farmhouse. Wheat beers are also frequently amped up with fruit flavors. Traditional Belgian wheat beers often include orange peel in the brewing process, but American brewers like 21st Amendment have upped the ante by adding watermelon in their Hell or high Watermelon. Berliner Weisse, a German sour wheat beer, was traditionally served with raspberry (Himbeersirup) syrup to balance the tartness. Today brewers create their own riffs of the style by adding fruit directly in the beer during fermentation. Locally in Jacksonville, Aardwolf Brewing Company has created several variations of their Lactic Zeppelin Berliner Weisse with guava and passionfruit. Samuel Smith’s The Old Brewery in Tadcaster, England produces several fruit beers that defy any other style categorization. One of their best is Samuel Smith Organic Strawberry a spontaneously fermented brew with tart and sour flavors similar to a Belgian lambic. The addition of strawberry juice adds some sweetness to balance the flavors. But, perhaps the fastest growing flavor among fruit beers is apple. With the growing popularity of hard cider, companies like Redd’s (part of the Miller Brewing Company) are capitalizing on the fruit beer trend. Available in several flavors, Redd’s is an apple-flavored beverage that is brewed like a beer rather than simply fermented like a cider. Whether you are a purist and think beer should taste like, well, beer or a progressive and accept the current flood of fruit beers hitting the market, one fact is certain; brewers are going to keep experimenting with new fruits and flavors. You may as well relax, fill a cooler with ice and add some refreshing fruit-infused brews for enjoying on the back porch on the coming hot summer nights. The power of sour is undeniable. For centuries, breweries have been making sour beers that range from mildly tart to toe-curling, tooth enamel-eating sour. Sour beers that go by names like gose (pronounced go-zah), lambic, Berliner Weiss and more are seeing a surge in popularity rivaled only by the IPA craze of the past few years. And, with the hot, humid summer months coming, you will see more and more of these thirst-quenching beers on local shelves. But, why do we humans have such a craving for sour things? It all goes back to biology. Sour tastes are generally associated with acids that are found in relatively few places when it comes to food. Somewhere in our evolutionary history, we lost the ability to synthesize vitamin C meaning that we had to get it from our environment in the form of food. Acids in the form of vitamin C are key nutrients in holding off a number of deadly conditions like scurvy and also help to build our immune systems. Since sour meant acid to our ancestors and that satisfied our body’s need for vitamin C, our collective physiology made us seek out acidic foods like citrus fruits. Now that we have an idea why some of us are inclined to enjoy sour flavors, let’s take a look at how sour beer developed. Before yeast was discovered in the late 1800’s, most beers were at least a little sour. This was because the role of yeast was not known to brewers and beer was usually brewed using open-topped fermentation vessels. Wild yeast “infected” the sugary pre-beer liquid known as wort and caused the magical process of fermentation to occur. Once the properties of yeast were understood, breweries began to control the amount of sour flavors in their beers. Some breweries, particularly those in Belgium continued allowing their wort to “spontaneously ferment” by withholding yeast and allowing natural yeast to inoculate the liquid. From these breweries come beers such as gueuze, an intensely sour beer created from blending one, two and three year-old lambic ales. Other sour styles such as German goze, are produced by intentionally adding yeast strains that add sour flavors to the finished beer. This style is also characterized by the addition of salt and coriander. Yet another style is Berliner Weiss a German wheat beer made with Lactobacillus bacteria and usually, but not always, served with flavored syrup. Yet another sour beer is Flanders Red named for the area of Belgium where it is made as well as the red color and sour flavor it obtains from the red wine barrels it is aged in. Sour beers have emerged as one of the hot trends in craft beer today. You can look forward to more and more sour beer produced by craft brewers in the coming months and years. Holding Brewing Permit #001 in the Commonwealth of Massachusetts is something of a big deal. It means that Harpoon Brewing Company was the first brewery in Boston. In the early day, the brewery, owned by three friends — Dan Kenary, Rich Doyle, and George Ligeti — was founded in 1986 after Kenary and Doyle returned from a trip to Europe where they fell in love with the fresh, local beers found there. Over the years, the brewery introduced new beers and lines. In 1993, Harpoon IPA, now a favorite among many beer-lovers, was launched as a summer seasonal. The beer was so popular that it brought the company out of the red and in to the black financially for the first time since its founding. More new offerings followed with the UFO line, launched in 1998 with the breweries first unfiltered brews. UFO, a German-style Hefeweizen, was a new style for New Englanders who immediately took to the cloudy, refreshing beer with its notes of lemon and garnish. Harpoon quickly became known as a brewery with its finger planted firmly on the pulse of the burgeoning craft beer revolution. To further highlight the talents of the brewery’s brewers, the 100 Barrel Series was introduced in 2003. Originally this program was intended to spotlight the creativity of a single brewer from inception to production. Brewers were challenged to use their imagination to create experimental styles or new twists on established styles. When the recipe is finalized a small batch of the brew is produced and offered as a special release to thirsty beer-drinkers everywhere. Th newest edition to the 100 Barrel Series is Nordic Saison, brewed collaboratively with Anders Kissmeyer of Kissmeyer Beer & Brewing, Will Meyers of Cambridge Brewing Company, and Jaime Schier of Harpoon Brewery. The brew is a study of fresh floral aromas and a tart, dry finish. Learn more about 100 Barrel Series: Nordic Saison in the official press release below. Boston, MA (July 1, 2015) – Harpoon is proud to introduce the 54th installment of the Harpoon 100 Barrel Series: Nordic Saison. Anders Kissmeyer of Kissmeyer Beer & Brewing, Will Meyers of Cambridge Brewing Company, and Jaime Schier of Harpoon Brewery created this effervescent golden Saison using local honey and cranberries, rosehips, yarrow, and heather flowers. Harpoon’s Jaime Schier first met and enjoyed beers with Anders Kissmeyer, a pioneer of the Danish craft beer movement, on one of Harpoon’s annual beer culture trips to Denmark back in 2005. So when Anders asked him to join his Saison experiment—brewing the same recipe at select craft breweries around the world— Jaime jumped at the chance. Together with longtime friend Will Meyers from across the Charles River at Cambridge Brewing Company, the three fashioned this Saison with a distinctly floral, herbal character, refreshing tartness, and sublimely dry finish. Harpoon Nordic Saison has a light body and a slight tartness and bitterness. The aroma is fruity and spicy with a subtle Citra hop note. The flavor is crisp, floral, and spicy from the addition of local honey and cranberries, rosehips, yarrow, and heather flowers. It finishes is crisp with a yeast spiciness, fruity complexity, and a touch of citrus. The Harpoon 100 Barrel Series Nordic Saison is now available in 22 oz. bottles and draft (limited availability). Harpoon introduced the 100 Barrel Series in 2003 to showcase the individual brewing talents of its employees. Every couple months, a different Harpooner is invited to choose a style of beer, formulate the recipe, and brew the beer. That brewer’s signature can be found on the bottle label. The beers in the series are one-offs; they are brewed in limited batches and are available only until the batch sells out. Since the series began in May of 2003, 54 different styles of beer have been brewed. For a complete list of beers that have been released as part of the 100 Barrel Series, visit www.harpoonbrewery.com. For additional information about the Harpoon Brewery and the Harpoon 100 Barrel Series, please contact Liz Melby atlmelby@harpoonbrewery.com. As a style, Gose originated over 1,000 years ago in the German state of Lower Saxony specifically in the town of Goslar through which the brew’s namesake river — the Gose — flows. About 100 miles west of Leipzig, Goslar rose to prominence in the 11th century, not only as one of the wealthiest and most important copper, lead, zinc, salt, and silver mining towns in the German Empire, but also as a brew center. The naturally saline water of the aquifer in and around Goslar was renowned for its high mineral content and lent that saltiness to the beers brewed in the region. By 1738, the mines in the Goslar began to deplete causing the population to shift to Leipzig. Along with the population, the breweries followed. Gose production quickly grew in Leipzig until it became the predominate style in the city and region. By 1826, Gose production in Goslar had fallen to such a small amount that the city council decided to abolish production. Gose’s popularity rose so much that by 1900 there were more than 80 licensed Gose houses in Leipzig. Because of wars and communist occupation, during the 20th century Gose slowly disappeared and became an extinct style. BUt, after the Berlin Wall fell in 1989 the style made a comeback due in great part to Gosebrauerei Bayerischer Bahnhof (Gose Brewery Bavarian Station), which opened its doors in 2000. 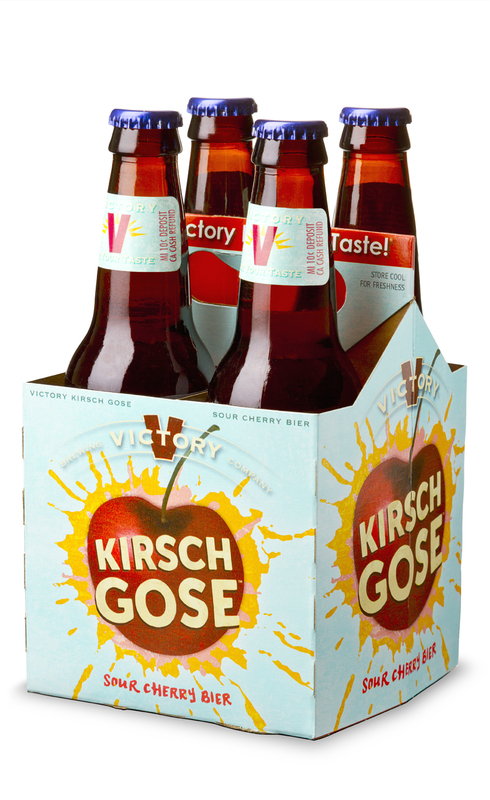 Now, Victory Brewing Company has tackled the style producing the distinctly flavored Kirsch Gose. Read the press release below for more information abut this new brew and the Gose style. Downingtown, PA, April 7, 2015– Victory Brewing Company (Victory) announces Kirsch Gose, its first endeavor incorporating natural fruit juices, which add subtle flavors over a unique tart and salty finish. Gose is a German-style brew that takes its name from the salinic river Gose. Promising to excite with the sharpness and sweetness of fresh cherries, Victory puts a modern twist on an old-world, time-honored process to bring a distinct and refreshing session ale to market. Available throughout Victory’s 35 state distribution footprint, Kirsch Gose’s suggested retail price for a 12 oz. four-pack is approximately $9.99, but varies upon location. Use Victory’s Beerfinder to discover a nearby location, or download the free Victory Mobile app for Android or iPhone. Goses, which are traditionally brewed to be slightly tangy and salty, have a longstanding German history since the 16th century. They are brewed using both malted barley and wheat to provide a bit of sharpness and a smooth mouthfeel. After the brewhouse additions of spices such as coriander, the style is then fermented with wild, top-fermenting yeast to produce a dry, bubbly, puckery product. Interestingly, because brewing goses required more wheat than the standard lager beers then in vogue, they fell out of production as post-World War East Germany (where it was primarily brewed) needing to ration their supply for bread making as opposed to beer making. The demolition of the Berlin Wall, in combination with the booming North American craft beer movement in the late 80’s, encouraged the gose resurgence in Germany with local Leipzig brewers and provided a canvas of endless creative possibility for North American craft brewers. Victory Brewing Company is a craft brewery headquartered in Downingtown, Pennsylvania. Founded by childhood friends, Bill Covaleski and Ron Barchet, Victory officially opened its doors in February of 1996. In addition to the original Downingtown brewery and brewpub, Victory recently opened a second state-of-the-art brewery in Parkesburg, PA to expand production capabilities and serve fans of fully flavored beers in 35 states with innovative beers melding European ingredients and technology with American creativity. To learn more about Victory Brewing Company visit us on the web at www.victorybeer.com. The smooth, creamy texture of beers like Guinness, Bodington’s and Old Speckled Hen is due to the addition of nitrogen rather than carbon dioxide. Since nitrogen forms much smaller bubbles than CO2, the result is a silky smooth mouthfeel that has won over legions of beer drinkers the world over. The popularity of these beers and the unique sensation and flavors created by nitrogen has contributed to the growing trend among craft brewers to add nitrogen to their beers. Over the past few years more and more brewers have added nitro taps to their tap rooms and begun experimenting with the gas. Nitrogen is largely insoluble in liquid, which is what contributes to the thick mouth feel. This effect is helped by a special piece of tap equipment known as a restrictor plate that forces the beer through tiny holes before it lands in the glass. That process causes the “rising” effect that is topped with the head. And it’s really only the bubbles on the sides of the glass that fall. Inside they are actually rising, as typically seen with a poured carbonated beverage. Left Hand Brewing Company of Longmont, Colo. was the first American craft brewer to introduce a bottled nitrogen beer without a widget to dd the gas to the beer. On the first night of the 2011 Great American Beer Festival, Left Hand revealed Milk Stout Nitro in a bottle. We here at CCB have decided to place a focus on our draft nitro beers. We think the nitro adds a unique aspect to many brands. Our tasting room has two nitro taps and we want to get more nitro beers out into the market. Since then, the trend has spread to many more breweries who have begun experimenting with putting all manner of beers on tap. 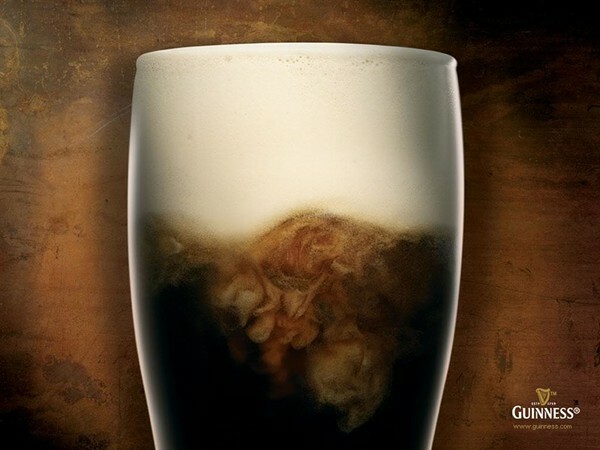 Traditionally, beers that are predominantly malt forward have been served on nitro. These beers consist primarily of stouts and porters, but may also include malty ales like Boddington’s. But, as the trend spreads, some brewers are trying the gas with pumpkin ales, red ales and even IPAs to spectacular results. The trend has become so popular that it has spawned nitro only beer festivals and even a new product that allows homebrewers to turn any beer into a nitro beer. Called NitroBrew, the new device allows beer-lovers to even turn store-bought brews into a smooth, creamy nitrogen masterpiece. To learn more about the NitroBrew, read the press release below. New York, NY — NitroBrew, an innovative new technology that nitrogenates any beer at the point of service, is now available to craft beer fans and home brewers at http://nitrobrew.com/shop/. An ideal Father’s Day gift, NitroBrew is the first commercially available product designed to bring nitrogenating technology into the home, enabling beer lovers to nitrogenate store-bought brews and hobbyist beer brewers to create their own nitro-style brews from scratch. In under a minute, NitroBrew turns any home-brewed or bottled beer into a sensational, silky nitro-style beer masterpiece. Nitro-style beers are rapidly gaining popularity among beer connoisseurs and foodies for their smooth mouthfeel and well-rounded flavor. The nitrogenated beverage trend has also crossed over into cold brew coffee, which NitroBrew can also be used to nitrogenate. Each NitroBrew kit includes a kettle, a discreet charging station and a small air compressor. NitroBrew is easy to use, easy to clean, compact and takes up little storage space.